Lake Forest College received a Phase II Faculty Career Enhancement (FaCE) grant from the Associated Colleges of the Midwest (ACM) to support a Collaborative Event entitled "Faculty Assessment of Student Learning Department by Department" focusing on effective practices in assessment of student learning outcomes. 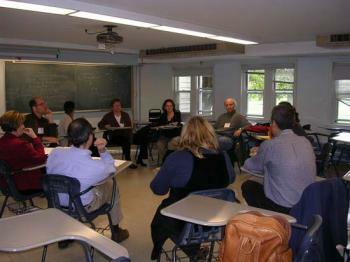 The workshop attended by approximately 50 faculty members from ACM colleges was held on October 24 – 25, 2008. The goal of the workshop was to deepen understanding and support among faculty members for effective practices in systematic assessment of student learning outcomes, particularly as they apply to specific content disciplines in the liberal arts across divisions. The workshop gave faculty members practical ways to: apply these practices across campuses; determine their effectiveness; and develop ways of sustaining and disseminating these effective practices. To demonstrate the effectiveness of this departmental approach, departments that enroll large numbers of students on ACM campuses served as models for other departments in the same division. The departments were Biology, English, History/Art History, Modern Languages, Politics & Economics, and Psychology. The event began on Friday with a working dinner and opening keynote address by Dr. Marie Baehr, Dean of Faculty at Coe College and an HLC consultant and expert on assessment in higher education. Saturday consisted of panel presentations from ACM faculty colleagues, breakout group working sessions, faculty sharing their work in a "poster session" and a culminating discussion.